These are lyrics by Terence Trent D'Arby that we think are kind of repetitive. 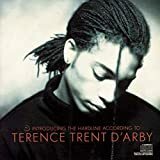 Terence Trent D'Arby's, "Let's Go Forward"
He says this phrase 3X, and he keeps repeating it several times over and over again. On top of that this song's duration runs for 5 min 32 sec. Submitted by: Add Then Up!